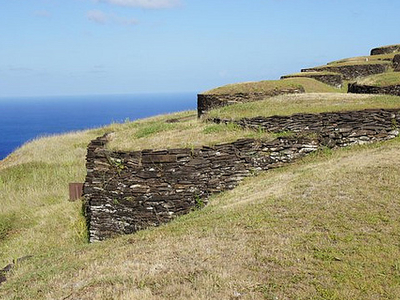 Orongo is a stone village and ceremonial centre at the southwestern tip of Rapa Nui (Easter Island). The first half of the ceremonial village's 53 stone masonry houses were investigated and restored in 1974 by American archaeologist William Mulloy. In 1976 Mulloy assisted by Chilean archaeologists Claudio Cristino and Patricia Vargas completed the restoration of the whole complex which was subsequently investigated by Cristino in 1985 and 1995. ‘Orongo enjoys a dramatic location on the crater lip of Rano Kau at the point where a 250 meter sea cliff converges with the inner wall of the crater of Rano Kau. 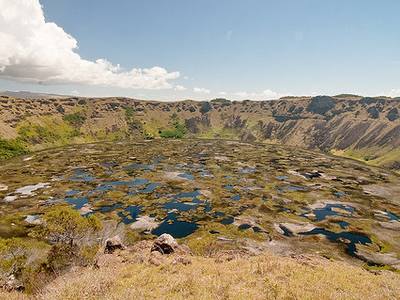 ‘Orongo now has World Heritage status as part of the Rapa Nui National Park. Until the mid-nineteenth century, ‘Orongo was the centre of the birdman cult, which hosted an annual race to bring the first manutara (Sooty Tern) egg from the islet of Motu Nui to ‘Orongo. The site has numerous petroglyphs, mainly of tangata manu (birdmen). In the 1860s, most of the Rapa Nui islanders died of disease or were enslaved, and when the survivors were converted to Christianity, ‘Orongo fell into disuse. In 1868, the crew of HMS Topaze removed Hoa Hakananai'a from ‘Orongo. This unusual rare basalt moai is now in the British Museum. 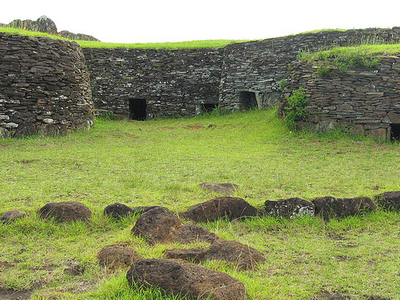 The site of ‘Orongo was included in the 1996 World Monuments Watch by the World Monuments Fund, and listed again four years later, in 2000. The threat was soil erosion, caused by rainfall and exacerbated by foot traffic. After 2000, the organization helped devise a site management plan with support from American Express, and in December 2009 more funding was announced for the construction of a sustainable visitor center. Here's the our members favorite photos of "Ruins in Chile". Upload your photo of Orongo Ceremonial Village! Cecilia Baudrand is the only Touristlink member to visit Orongo Ceremonial Village. Have you been here? Click here to save it.